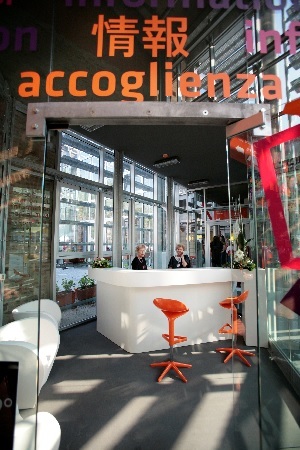 In the last 20 years Turin has gone through several radical transformations and changes. When we talk about that we can’t forget its passage from “industrial town” to “post-industrial town”, breaking away from its past. From automotive to baby-parking and from heavy metallurgic plants to organic and “from farm to fork” food-stores. But that’s not all. Empty spaces, left by a decaying industry fabric, have inspired requalification initiatives and a social, educative, cultural enterprise everywhere in the city. In this context stems the need for re-appropriating and re-dwelling, through the involvement of the whole town community So, those ready to fill, empty spaces themselves become, in a perspective of recycling and re-use, the perfect container for inclusion, increased participation and for offering possibilities, events and moments of social aggregation. Here was the most fertile “humus” to create new special structures: the Case del Quartiere (Houses of Neighbourhood). Common spaces, multipurpose cultural hubs, social laboratory – all at the same times. In an House it is possible to propose events, to organize or attend a workshop or an artistic atelier, to discuss about common themes or simply use services provided. They are friendly places, where a person is not only a guest, or a resident, but above all is a citizen. Something about history. In Mirafiori Nord, a southern outskirt city district, during year 2000 the Urban 2 project started, a Community Initiative Program (CIP) that involved 10 Italian areas, including this district in Turin. The project defined three working areas: one about requalification and renovation of territory, one about creation of knowledge and infrastructures for economic development and the last one about the promotion of social integration, cultural growth, and fighting of exclusion (1). Goals consisted in starting-up the economy again and give more power to economic, social and cultural activities by way of building networks and making connections and links between all stakeholders interested in the community development. So, after a sound programming work supported by a working table that put together resident citizens, non-profit sector and local associations, in 2007 Cascina Roccafranca was born, an ancient farmhouse brought to life again after years and years in abandon. Three years later, in 2010, in San Salvario, an historic and popular district close to downtown , the Casa del Quartiere di San Salvario was born, after a big renovation because the building was a public bath in the past. 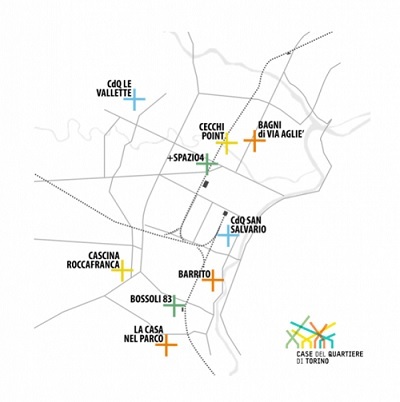 Nowadays the city, thanks to the sponsorship of the City administration and of the Compagnia di San Paolo Foundation has nine facilities called Case del Quartiere Network (CdQ Network), all having similar features. Cascina Roccafranca was the first House opened in Turin and it is now in its eighth year of activity. Its creation, apart from the renovation of the property, was, an inclusive and shared process, that lead to an open, direct and constant confrontation on the analysis of needs and proposals.. The socio-cultural centre is managed by an atypical foundation, the Cascina Roccafranca Foundation. Atypical because it’s an entity of its own, with few similar experiences to compare, composed by a mix between public system (the City municipal administration and the District administration) and private system (representatives of local associations) (2). First of all, this way of managing the facility is meant to be a common and shared warranty about its mission, and allows more flexibility in management and a greater self economic sustainability. The hub has many spaces inside: a restaurant and a cafè, a baby parking and a game point, two big halls utilised for events, shows, conferences, exhibitions. Then there are two rooms equipped for workshops and courses, some thematic rooms and an ideas incubator. And more: some free specific counselling gates, a self-serve water dispensing kiosk, a urban eco-museum. All these activities and spaces make about 3000 people cross Cascina Roccafranca gates every week. All workers operating inside promote a culture of volunteering, welcoming and listening. They have a service role, because they follow and support people who would like to be “protagonist”. A supervision service, able to coordinate several capacities, skills and resources. All these features make Cascina Roccafranca a common space and a multipurpose hub, a culture-making model that is shared, innovative and bottomed-up. 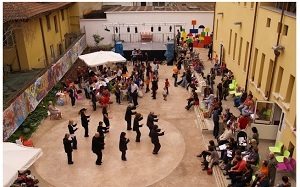 The opening of similar hubs in different and so far apart areas (nine centres sprawled in 8 out of the 10 districts in which Turin’s municipality is divided) has brought forward an increasing need for the staff of all Houses to know each other and to join in a working group, in order to promote and share skills, as well as experiences from previous, current or upcoming threads. For this reason, in 2014, all nine realities, with Cascina Roccafranca Foundation acting as promoter, have competed in a national call about culture, with a view to creating a network. A CdQ Network indeed. The call, named cheFare2, aimed to collect and evaluate original knowhow and new cultural procedures, emphasizing some aspects: public participation, cooperation, benefits for the community and social impact. The call was promoted by the Associazione Culturale DoppioZero in partnership with several organizations, including Tafter magazine online, that are interested in publicizing and diffusing new strategies for cultural world. Houses are: Cascina Roccafranca, Mirafiori Nord; Casa del Quartiere di San Salvario, San Salvario Casa nel Parco, Mirafiori Sud; Hub Cecchi Point, Aurora; +Spazio4, San Donato; Bagni Pubblici di via Agliè, Barriera di Milano; Barrito, Nizza Millefonti; Bossoli83, Lingotto; Casa del Quartiere Le Vallette, Le Vallette. Beyond the characteristics of each House, different about placement, legal status or realized projects, it’s interesting to remind some data. At least 7000 frequent visitors and 360000 annual passages, 250 associations and informal groups, 127000 square meters of arranged space offered, half of them outdoors, thousands of events, courses, workshops and other cultural works every year, proposals to all ages, from 0 to 99 and (in case) more. So, these hubs really are spaces made available to all people, opened and friendly, respecting different tendencies in culture, religion and politics without discrimination. Moreover single hubs have strong local roots. So, people participation often is a “local” participation. People that, around Houses, live, work, move. This is an important feature, because it defines services and proposals strongly. A multi-ethnic district like San Salvario or Barriera di Milano, will have different demands from a district like Mirafiori Nord, that is rather extended and “aged”. Anyway there’s a same common point: to propose answers and solutions to a need, as a result of a sharing and collective effort. Nowadays CdQ Network is arrived at a turning-point of its way. To qualify itself in terms of governance and strict criteria is the next goal, with the right “position” balanced between public service and private company and supported by the largest number of partners. This point influences the economic sustainability too. 100% self-sustainability? But if the Houses partially carry out partial functions of public service and “light welfare” (4), why don’t improve and support them? All these questions are to be analyzed with public institutions (municipality, districts…) and in sharing modality with all people that try to increase and improve these spaces. That’s the real Network’s challenge.